The value paid for an experience will never expire! We want you to enjoy your experience and we understand it could be awhile before you reserve and enjoy the activity. Your experience certificate is valid for 12 months from the date it was purchased. 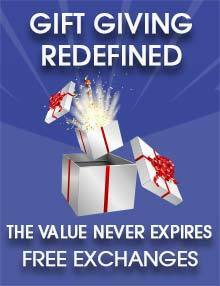 After the 12 month period your certificate holds it’s value indefinitely. If the cost of the experience has gone up in price you will only have to pay the difference between the original price and the price at time of reservation. To use your Experience Certificate beyond the 12 month period of validity, contact Breakaway Experiences at customerservice@breakawayexperiences.com or 1 800 813 8412. Worried they might not like it? Don’t be. We have made our Exchange policy as easy as possible for you and your recipient. If your gift recipient decides they’d like to exchange an experience you gave them for another of our hundreds of amazing experiences – no problem! Please not that an exchange can only be made prior to activating your experience. 1. From your Gift Experience Dashboard, click on Exchange next to the experience you would like to exchange. 2. When prompted, confirm that you do want to exchange the experience. 3. Within 48 hours, upon exchange approval, you will receive a gift certificate from Breakaway Experiences equal to the value of the exchanged experience at the time it was purchased. The gift certificate can then be used to purchase any experiences you wish available from Breakaway Experiences. You can track the progress of your return request at all times from the Exchange Requests page in your "My Account" section.